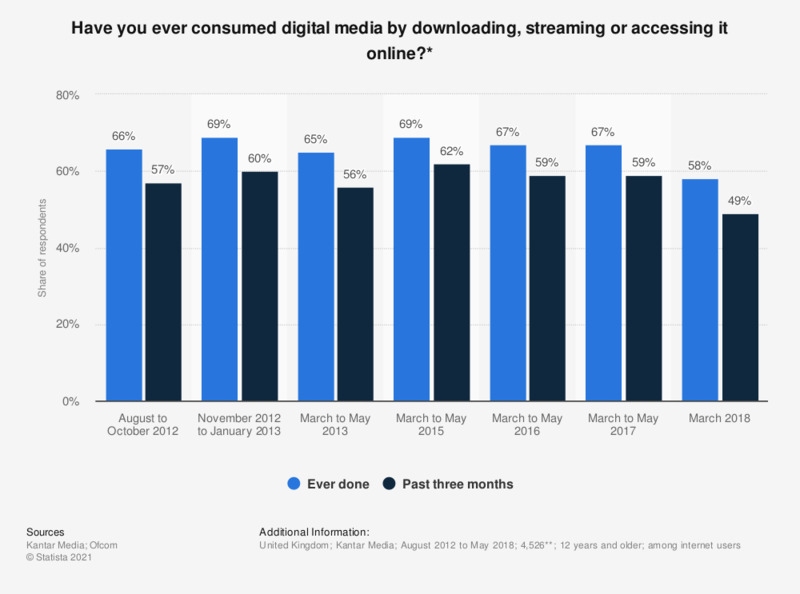 The statistic presents data on digital media consumption among internet users in the United Kingdom (UK) as of eight survey waves running between August 2012 and May 2017. As of wave eight, ending March 2018, 58 percent of respondents reported ever having consumed media digitally, compared to 49 percent that reported having consumed digital media in the three months previous to survey. * Consumed includes streaming, accessing and downloading. Digital media includes: music, films, TV shows/programs, computer software, video games and e-books. ** Base of most recent survey wave (Wave 8). Base varied by wave: n (W2) = 4,728; n (W3) = 4,708; n (W4) = 4,673; n(W5) = 4,552, n(W6) = 4,670, n(W7) = 4,573.